A beautifully written first novel about life and shingle beaches. 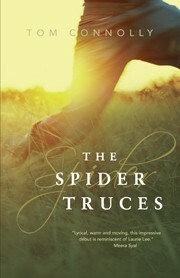 Ellis O’Rourke’s past in ‘The Spider Truces’ by Tom Connolly, comes to call for him one morning in 1990. It is now a year after his father death and finally his sister has relinquished her hold on the box he left for them. As Ellis lifts the lid the forgotten scent of cherry wood fires comes drifting out, sending him thirteen years into the past, right back to a small cottage in Kent. Age 9 Ellis is a day dreamer, preoccupied by his fear of spiders and the fact his father won’t tell him anything about his mother. Denny is a strong father figure with a profound love for his family. When Ellis threatens to move to the North Pole to get away from the spiders Denny is later helped by great-aunt Mafi and Ellis' older sister Chrissie, declare the first spider truce. Their life is full of these moments, between Ellis and his search for himself, Chrissie and her chain of boyfriends, Denny and his wounded heart. But luckily they have wise old Mafi and their love for each other. The story is well spun and moves with a soft humdrum. It keeps a nice autobiographical feel to it all the way through and crisis creeps into the plot, turning situations on their stomachs more than once. Mistakes are made, promises broken, putting this father and son relationship to the test. The cottage is a splendid setting, what with the mysterious leak which weakens the structure of the building and pushes Denny, to devote himself to its repair, as if he were trying to mend his own heart. The themes in this book are not unknown, but the O’Rourke’s story is their own and we can’t help but get attached to little Ellis’s rich landscape of thought and inquisitiveness about life. He makes us laugh as much as he makes us reflect, and when he falls for the silent laughter of a girl called Chloe Purcell we are right there by his side. The author demonstrates a clear and fascinating knowledge about arachnids and also charms us with the presents of the sea, which seems to echo with auntie Mafi’s saying ‘any day you see the sea is a good day’. Overall the story is like a lukewarm bath, the writing is very light on the page sometimes not managing to reach the reader quite as much as it should, but there is a lot of heart in it. It is like a rich memory in the sense of description, which are rendered even more delightful when the surreal comes to fluster reality. If it had been a little shorter it would have left a more lasting impression, but the ending is like a friendly nudge, inciting us to grab hold of the present and leave no room for future regret. A story which is bound to make you revisit your own childhood.